I have been surprised by the vast expanses of open water that we came upon after entering the ice. The average ice concentration of the last five days has been about 65 percent, with about 36 percent of that ice being first-year ice, 14 percent being multiyear ice and 10 percent being brash ice (small broken ice floes). Air temperatures have been above freezing, even at 82.82N, 15.16E, so that there have been no new ice formation observed the last five days. Viewers and listeners to the last Climate Show (and my Radio Ecoshock interview before it) will know something of my thinking on what all this portends, but I’ll have a post pulling it all together once the minimum is finally called. 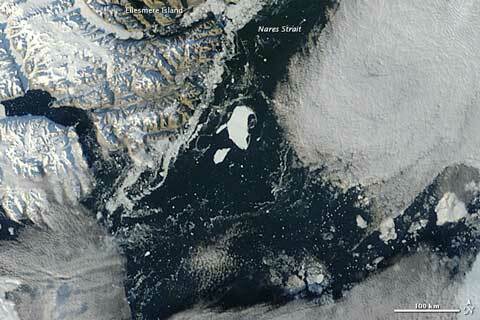 Elsewhere in the Arctic, this year’s Petermann ice island is motoring south down Nares Strait, as this NASA Earth Observatory image shows. To get an idea just how big this lump of ice is, note that the scale bar in the bottom right of the image is 100 kilometres. It’s big. 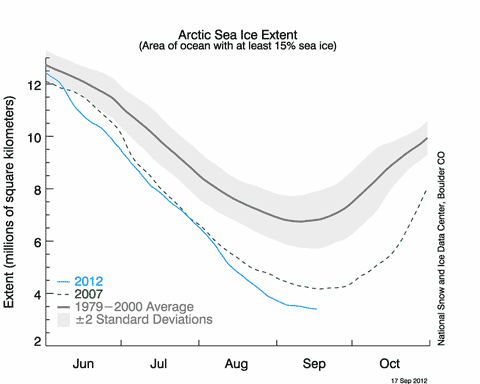 Meanwhile, professor Peter Wadhams, head of the Polar Ocean Physics Group at Cambridge, has told the Guardian that he expects the Arctic to be ice-free1 means in summer (Aug/Sept) within four years. Given this summer, I can’t say that I find much to disagree with in his prognosis. Most people define “ice-free” to be 1 million km2 remaining — the thick ice close to the Canadian archipelago — but it’s not clear from the Guardian if this is how Wadhams defines it.